Cream the butter and sugar together until light and fluffy. Beat in the extract. Then beat in the egg, scraping down the sides of the bowl to make sure all the butter is incorporated. Whisk the baking powder and flour, and slowly add to the bowl while keeping the mixer on low until the dough comes together. Scrape the bowl again, and finish mixing with a wooden spoon or your hands to bring the dough completely together. Form into a flat disk, wrap in plastic, and chill for an hour. Preheat oven to 350F Line a baking sheet with parchment. Roll out the dough on a lightly floured surface, try to get it just under 1/4 inch. Cut the dough into rounds using a small cookie or biscuit cutter. My cutter measures just under 2 inches across. Carefully transfer the dough to the baking sheet, 1 inch apart. Bake the cookies for about 8-9 minutes. Note: they will not brown, and will still be completely pale when done. Don't over-bake because you want your cookies to be soft. I like to do a test cookie or two to check my settings and timing. Let the cookies cool on the pan for a few minutes, then cool completely on a rack. 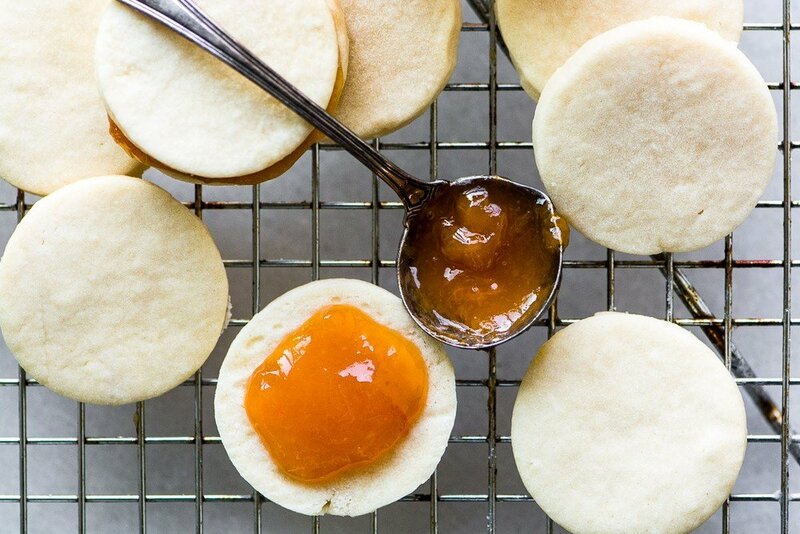 Put a small amount of jam in the middle of one cookie and top it with another. Press down gently.